Designing stickers everyone will love can be a make it or break it move for your business advertisement. This article has tips on how to make high-quality stickers for business promotion. If you want your business to stand out in a crowd, you need to get creative. “Nothing is more efficient than creative advertising” according to the Harvard Business Review. There are few better ways to creatively advertise your business than a well-designed sticker. Stickers can be affixed anywhere and can go where other promotional business materials can’t. A well-placed sticker can catch an eye like nothing else, and potentially bring in a wealth of new attention for your business. They’re an indisputably great way to extend the reach of your brand. Maybe you already have a great design ready– but do you know how to make high-quality stickers? Poor planning can damage the potential of a great sticker. If you’re looking to print stickers for your business, you’ll want to make sure they stand up to the quality of your product or service. Read on to find out how. When printing stickers, it’s important to understand where the sticker colours are coming from. Most stickers will be printed using process colour, which relies on four primary colours to create thousands. If you’ve changed the ink in your at home printer before, you’ve probably noticed that most printers run off of four cartridges: Cyan, Magenta, Yellow, and Black. In creating other colours two of those initial shades are mixed, one being printed right after the other. For example, to create an orange design through process colour printing, yellow ink would be mixed with magenta. There is minor evidence of this process typically found in the final work. Though hard to see by the naked eye, process color typically leaves minor dithers and dots as a result of the mixing. This is evident in some color work more than others, with gray being one of the most severe. Pantone printing is a more expensive process that doesn’t rely on process color and can produce an exact 100% color reproduction from the source material. If exact accuracy is important to you, you may consider going this route for the best sticker. 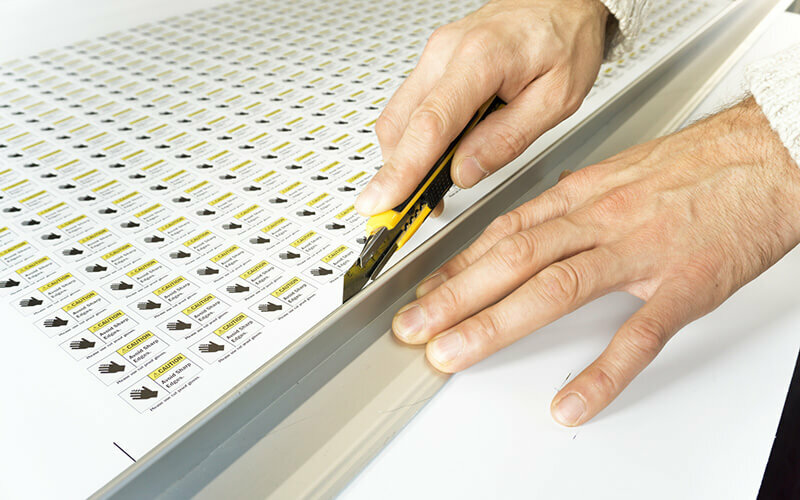 When designing good quality stickers, you should keep in mind the strengths and weaknesses of process color printing. For example, light shades are typically very hard for process color printing to accurately reflect. CMKY values that are under 10% may be lost in the printing process– darker shades will typically print better and create good quality stickers. Avoiding large areas of solid color in your designs will also greatly benefit the final product. A large area of one solid color makes the dithers and dots of process color printing easier to notice. Using gradient coloring is one way to help avoid this. Adding extra background elements or distressing the background design also can aid in breaking up large areas of color. You may or may not already have a plan of where you want your stickers to be displayed. If you do, it might help inform some decisions in creating the design of your sticker. The shape is one of the most obvious traits to be decided. Your sticker could rectangle or square, circle or oval. The choice is yours. Circle and oval stickers are generally rarer and may stand out more. Circular stickers also can avoid some of the wear and tear that is inflicted more easily upon the edges of square and rectangle stickers. That being said, it is mostly an aesthetic decision and should be based off where you envision your stickers may be displayed. Outside of shape, considering the size of your stickers before printing is an important step. Many stickers will be viewed at close proximity. When checking their resolution on a computer, they should have a DPI value of at least 300 to ensure that they’ll be clear and legible at a close distance. You don’t want to get so preoccupied with the sticker design itself that you forget to consider what material it will be printed on. There are plenty of different material options when it comes to printing good quality stickers. Your ideal choice will probably depend again on the sense of where you think your sticker may end up– different materials are more suited for certain locations than others. BOPP film (standing for Biaxially-Oriented Polypropylene) is a great and standard choice for typical promotional stickers. The other most frequently used material is removable vinyl. Both options are water-resistant and fridge/freezer safe, but vinyl is thicker and more durable– making it better suited for outdoor surfaces. BOPP labels are thinner and can be made on transparent stock, important if you’re using stickers atop anything you’d still like to see inside of. You could also print your stickers on textured paper stock for an especially classic look. Whatever stock you use, you’ll also need to decide on a finish for your sticker. Depending on your preference and intended use, you could go with a matte, gloss, or UV (high gloss) finish. Matte finishes provide a classy look that also better hides smudges and fingerprints. A high gloss finish, on the other hand, can make text and images look brighter and sharper. This could make your sticker more attractive and eye-catching. There’s no one correct answer in selecting material or finish for your stickers. That being said, proper consideration and planning before printing will help create the best sticker for you. With the above tips, you’re well on your way to creating attractive and eye-catching new material for your brand or business. Stickers are versatile and creative tools for promotion, and ensuring that you are creating the best quality stickers you can is an important step in extending the reach of your business. Now that you know how to make high quality stickers, you can get started. If you’re ready to get printing, please contact us at any time for help or a quote. Need help designing a sticker? We can do that too. We’d love to aid you in creating exciting and creative material for your business.